This week, the Best of Canberra quest took me in search of a good Laksa. I love a Laksa, but don’t eat them that often for fear of spattering all that noodle and curry goodness down my front. So, dressed in dark colours, I relished the excuse for a couple of tasty lunches. When we put the shout out for nominations we were overwhelmed with calls of ‘Dickson Asian Noodle House’. So much so that I honestly started to wonder if it was worth having a taste off at all. But among the lone shouts of personal favourites, then there were a few enthusiastic nominations for the Fish Shack. Surprising the nominations may be, but consistent and enthusiastic, so we decided to put them up against this monster of Laksa popularity in Dickson and see what happened. First up was the Fish Shack. In my uncool haze that never really takes me into the City, I hadn’t even heard of them and yet there they stand in Petrie Plaza, wafting the enticing smell of fish and chips at anyone who dares walk too close. We ordered seafood Laksa (given the name, it’s that or vegie) and I hate to confess, I didn’t have huge hopes. I mean, how could a fish and chip stand make the best Laksa in Canberra? But I was surprised. 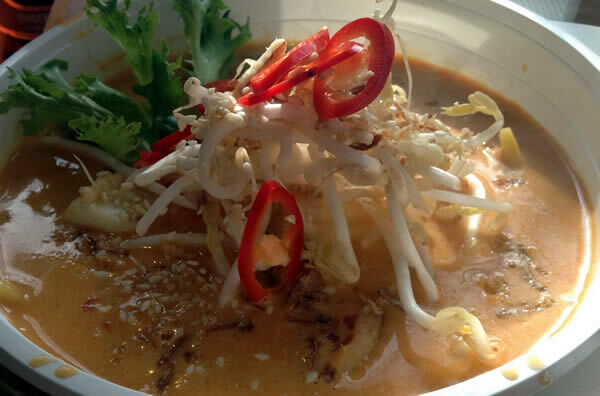 The Laksa came out with that gorgeous red curry colour, all creamy and lovely looking and topped with fresh crunchy bean shoots and sliced chilli and (what seemed a bit randomly) a few sprigs of curly lettuce. My dining companion and I both tucked in and a ‘wow’ escaped our lips at exactly the same moment. It was good. Delicous creamy curry soup, with a distinct but subtle heat that catches in the back of the throat just long enough for it to be enjoyable. Mmmmmm. The true beauty of this dish though was seafood. It was made with generous portions of fish, squid and a few fat prawns, with plenty of noodles. The crunch of the garnishes cut through the creaminess of the soup perfectly. Both of us cleaned our bowls as best we could without drinking from them. It was good. The next stop (on a different day – I’m not that much of a Laksa fan) was the Dickson Asian Noodle House in Woolley Street Dickson. This place was described to me as a Canberra institution. The menu displayed some great traditional Malaysian dishes such as Char Kway Teow, which made me think we must be on to a winner. They do Laksa options in a half bowl or full bowl. I went with a half bowl (which was only slightly smaller in quantity than the Fish Shack counterpart) of seafood Laksa (in the spirit of a good comparison). The first noticeable difference to this dish was that it was topped with tofu which absorbed all the flavours (yum) and the soup had a slightly more oily consistency. The soup itself was similar. Perhaps slightly more spicey but a marginal difference. The big gap came with the contents. The seafood was heavily padded with crab and seafood stick. There were a couple of prawns and some squid but most of the ‘seafood’ was the stick. As I’m not a massive fan of seafood sticks, it lost me a bit. 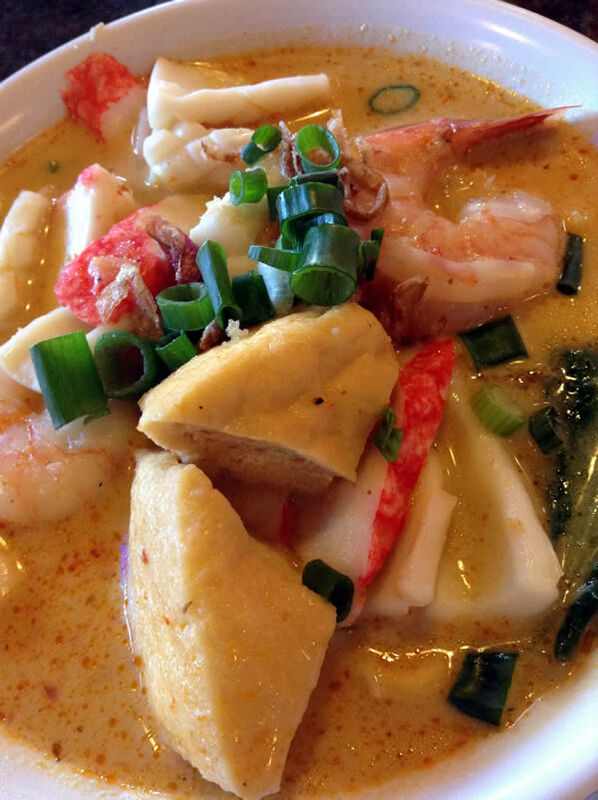 I’m sorry to all of you who put a shout out for the Dickson Asian Noodle House, but to my mind, the Laksa I would head back for would be at the Fish Shack. No-one is more surprised about this result than me. Before you dismiss my opinion on this, get along to the Fish Shack and try their Laksa. It’s pretty d*mn good. If the Asian Noodle house in Dickson is full, pop around to Little Thailand in Cape street. $10 lunchtime laksa. Tried the fish shack today. I rate it. Needed some more kick – had hokkien but no rice noodles. The fish and prawns tasted great. I went to the Fish Shack yesterday as well, for the seafood laksa. The fish in it was really good. Generous amount of the fish, plus a couple of prawns and a few pieces of squid. No rice noodle, only wheat noodle, which isn’t quite right. Bit of a tinned-soupish character to the stock base, and a thick, rich, coconut creamy texture. Needs rice noodles, a bit more spice, a better seafood stock base & a bit of acid to balance out the sweet & rich. OK, but not better than that as a seafood laksa. The combination laksa at Ginseng in Manuka is a steal for $10. Tops for flavor and tops for price. You picked the worst laksa to try. The duck laksa is to die for ! With the Asian Tea House’s (in Gungahlin) duck laksa being a close season. The seafood Laksa at Dickson is pretty much their worst one. Try the combination laksa (extra tofu) next time.